Floor fixing feet - Parallel protection rods - Beech wood handrail - Stainless steel handrail (special version). 90° corner joining with stainless steel elbow. Magnificent presence of glass in a special application that highlight the pure state of glass. No need for a handrail that would impede on the beauty of this 1.5-inch thick edge of glass. A railing is used to prevent falls. Typical height is one meter, though this may vary depending on location. It can be made from glass panels, cables or balusters of iron, aluminum, wood or another material. The gaps between vertical and horizontal elements should be small enough to prevent children from passing through. 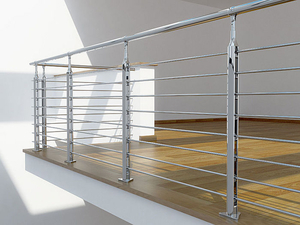 Railings are found along the edges of staircases, balconies, mezzanines and any other place where falls are possible. Railings can be made of wood, stone, metal, glass, plastic or other materials. Wood railings are aesthetically appealing and can be carved in high or bas relief. They are usually used indoors. Iron and aluminum railings are also common. The latter are particularly suited to exterior use because they resist corrosion. Choice of railing will depend on its location. An outdoor railing should resist corrosion. Maintenance for wooden railings should be envisioned. Local safety regulations must also be considered, especially where children are present.